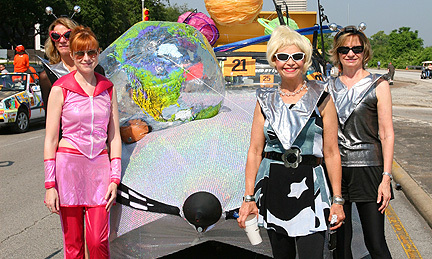 “The Houston art car parade” is the largest in the world. The parade was the first of its kind when it first launched on May 14th 1986. There were 11 entries, which has grown to over 300 entries. Not only does the parade keep going strong with many entries, it has turned a page in public art, it is highly respected. People from across the state and the country come to Houston to to gaze in amazement at this extraordinary event. Wondrous displays of all different sorts of art grace their presence each year; with everything from cars and bicycles to rollerblades. Thousands of people will brave the mid summer heat and line the streets just to get a glimpse of the incredible works of art rolling past. The art usually goes above and beyond what people would expect to see; from beautifully custom painted cars to giant rolling telephones. You couldn’t possibly know what you may see at one of the parades. You could see cars on top of cars, racing cars or just plain competitors rolling by on a pair of roller blades. You will love spending time watching these glorious creations and then afterward picking out the one you liked the best; maybe even seeing it at the Art Car Museum. With any style of art car, you can decorate in paper mache, metal, paints or anything to create a one-of-a-kind piece of art. 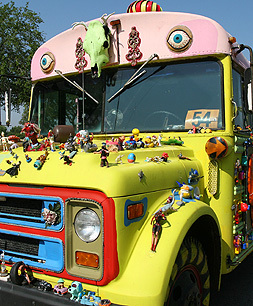 “The Art Car Museum” in Houston was given the nickname “Garage Mahal” and anyone can visit the museum or the online site for a grand display of “Garage Mahal Art”. The Art Car Museum was reopening with a fresh start on March 8th, 2008. The Museum is located at 140 Heights Blvd. in Houston, Texas. Within the Museum walls you will discover that the art work is all one of a kind. Rather you see a car with a giant duckbill, or a huge sea creature or even a huge pair of shoes; you will know that you are looking at a masterpiece. Where else could you find that kind of art? The art submitted is a prideful accomplishment of art with morals that go as deep as any artists. Some of the entries put several hundred hours of work in on their creations and truly deserve a pat on the back at the very least for their efforts and hard work. The Houston art car parade is poplar with thousands of people each year to line the streets and will continue to make people smile and get involved for many years to come. 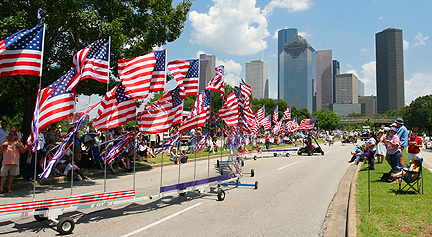 Every May the parade is one of the most popular and fun events for people in Houston. It has become a tradition and is a wonderful expeiance for families and people to do together. So bring out your old cars, your roller blades or anything on wheels; anyone can decorate them and do a great job at it. So step up to bat and get your entry in each year. There will be many great parade years in the future. Sneak Peek, come to the Orange Show on Friday night and get the first look at the mobile creations from all over the US. Art Car Tailgater! Saturday, May 10: 9am-1pm, Come see the entries up close and learn about the vehicles from the artists themselves as they line up along Allen Parkway from Taft to Shepherd for the parade. 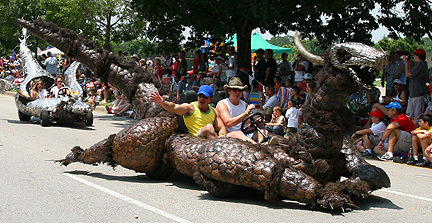 Art Car Parade, Saturday, May 10: 1-3pm, More than 250 of the most amazing motorized creations you've ever seen! Starts at Taft and Allen Parkway inbound towards downtown, left on Bagby and around Heritage Society, back down Allen Parkway outbound and ends at Shepherd.